It’s almost the week-end. And another glorious week of weather behind us in the London area! Soooooo lovely to see vibrant colours and blossoms again! Today, I’d like to share a super simple raw dessert idea that I learned in Thailand when on my inaugural visit in 2009. Relaxing outside a humble jungle house, my first ‘raw food lesson’ took place at a vast wooden table, protected from jungle rain (which we didn’t see!) by a beautiful, hand crafted bamboo roof. To be honest, it couldn’t have been more magical. I returned to home soil with fresh eyes and a host of ideas on how to change the way I ate. or … any fruit you love that you’d like to use to make a sorbet! Chop your chosen fruit into small chunks and place it in a zip lock bag in the freezer. I use two methods for making sorbets this way. I either take completely frozen fruit and use the mini bowl of my food processor and pulse until the fruit is sorbet consistency. Or, if the fruit is partially frozen, I pop it through my juicer, using the mincer attachment and a perfect sorbet emerges through the chute in seconds! Either way, the result will be a perfect, refreshing sorbet with no added sugar, or just a little natural sweetener to taste, if you need it. Oh. And have a fantabulous week-end! Which fruit sorbet are you going to make first?! I’m loving all of the recipes. Several of them have made it onto my healthy eating Pinterest board!! Keep em coming!! Oh I like the juicer idea! So simple! I couldn’t live without my juicer. I use it to juice and to mince my sweets. It’s one my kitchen babies Adriana! Indispensable. Yuuummmm . . . 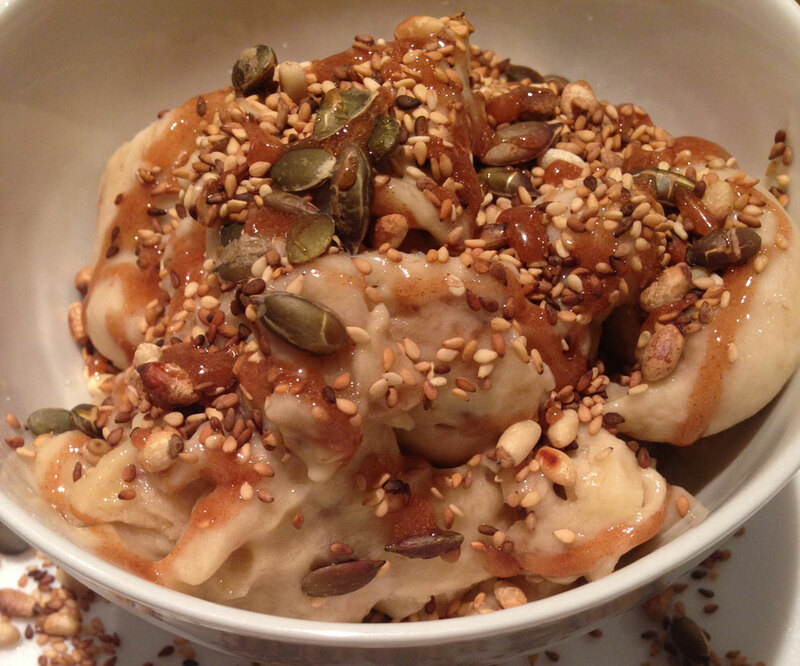 I love making banana “ice cream” this way, I’ll have to try it with other fruits. Mango sounds amazing. Looking forward to the toppings! They’re simple toppings, but overlooked by many Jessica. 🙂 … Scheduled for Monday! Have a great week-end. Ohhh yum – strawberry sorbet is my favourite!